Mayenne is a department in northwestern France and is part of the region of Pays de la Loire. The department does not have a sea coast, but about thirty kilometres to the northwest is Mont Saint-Michel Bay. The capital and largest town is Laval in the centre of the department. To the north lies the department of Orne, to the east lies Sarthe, to the south lies Maine-et-Loire, to the west lies Ille-et-Vilaine and to the northwest lies Manche. The department forms a roughly rectangular shape, being 90 km (56 mi) long by 77 km (48 mi) wide, with a total area of about 5,175 km2 (1,998 sq mi). The River Mayenne flows centrally through it from north to south, passing through the towns of Mayenne, Laval and Château-Gontier. After leaving the department, the river joins the River Sarthe to form the River Maine which later joins the River Loire. The department is varied in topography. Much of it is largely flat, but there are also hilly areas, some with steep-sided valleys and ravines. Of the total area of 1,275,532 acres (516,189 ha), some 875,000 acres (354,100 ha) are arable, 170,000 acres (68,800 ha) are grassland, 65,000 acres (26,300 ha) are forests and woodland and 50,000 acres (20,200 ha) are heathland and moorland. To the north lies the Armorican Massif, a plateau that has been eroded over time, the highest summit of which, the Mont des Avaloirs, is the highest point in the department at 417 m (1,368 ft) above sea level. A branch range to the south of this plateau forms the ridge that divides the Mayenne Valley from the Vilaine Valley. 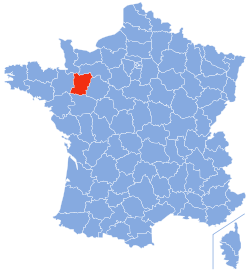 The department is subdivided into three arrondissements: Mayenne, Laval, and Château-Gontier; and is coincident with the Roman Catholic Diocese of Laval. Mayenne has a diversity of habitat types such as forest, heathland, bog and farmland. Some 1445 species of plants, 63 species of mammals, 280 species of birds, 16 species of amphibians and 11 species of reptiles have been recorded, as well as thousands of species of invertebrates. The peat-lands and bogs are often fringed with woodlands of alder and ash, and in some places carnivorous plants such as sundew and butterwort flourish, fritillaries, marsh cinquefoil and cottongrass grow and butterflies, dragonflies and spiders abound. The woodlands are mostly small with the deciduous trees dominated by oak. Here roe deer, badger, fire salamander, Aesculapian snake, middle spotted woodpecker, little owl and white admiral can be found and uncommon plants present including European columbine and wild russet apple. The dry grasslands, which cover the limestone and sandstone soils, are also rich in fauna and flora. They house the snake Vipera aspis, the large blue butterfly, the blue-winged grasshopper and the bee orchid. The heathland in the north of Mayenne is populated by dwarf gorse and cross-leaved heath and there are plenty of spiders, nightjars and warblers. The old quarries are the refuge of bats, amphibians, the shining cranesbill and greater butterfly orchid. Rivers and ponds are home to eel, northern crested newt, European otter, kingfisher, grass snake, common moorhen and plants such as spearwort, yellow flag, arrowhead and Isopyrum thalictroides, a small poisonous plant. The department is largely rural with about 80% being used for agriculture, 8% being urban area and the remainder forest, heath and plantations. Livestock farming predominates, with the breeding of cattle, horses and pigs, and also bee-keeping being important. The soil is generally poor, but it is of better quality around Laval and Château-Gontier. In these parts corn is cultivated and there are plantings of hemp, flax, fruits and vines. There are many apple orchards and large quantities of cider are made. The department is rich in mineral resources; iron and coal are mined and there are quarries for marble, slate, building stone, limestone and flint; the white sand deposits are used in the manufacture of glass. Industries include the manufacture of linen, paper and hemp, and cider-making is traditionally carried on in the department. Office furniture is manufactured in Château-Gontier, and Laval is active in the industrial sector, with dairy products, electronics and chemicals in a modern science park. ^ Schama, Simon (1989). Citizens: A Chronicle of the French Revolution. New York: Knopf. ^ a b c d Comprehensive Dictionary of the World. Mittal Publications. 1992. pp. 806–807. GGKEY:RC6C27C4NE1. ^ a b c "Exposition: "La Biodiversité en Mayenne"" (in French). Mayenne Nature Environnement. Retrieved 17 October 2015. ^ "Le contexte Meyennais" (PDF) (in French). Préfecture de la Mayenne. 2009. Retrieved 24 September 2015. ^ a b Bozman, E.F. (1966). Everyman's Encyclopaedia: Volume 8. J.M. Dent and Sons. p. 301. ^ Weiler, Nolwenn (25 January 2015). "En Mayenne, des salariés sauvent leur entreprise de la faillite" (in French). Basta!. Retrieved 24 September 2015. Wikimedia Commons has media related to Mayenne.